Balloon Bouquet "Simple & Elegant"
Do you know what the secret behind any stunning balloon bouquet is? You need to blow up the balloons to exactly the same size! Below we show you all the steps to create this unique balloon centerpiece that we like to call "Simple & Elegant." Its simple design in combination with shimmering, pearlescent balloons gives it an elegant touch that suits virtually any occasion. Everything ready? O.K., let's start to blow up a balloon with helium. 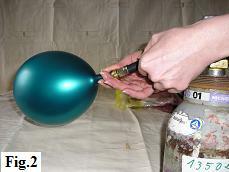 Gently slide the neck of the balloon over the nozzle, keeping a firm grip with your thumb and index finger (fig. 1). Just a word of caution, the type of valve we are using here is commonly referred to as a 'Quick Fill Station'. It works simply by applying downward pressure to the black flexible section. 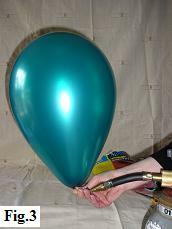 If you've never used one of these before, press it down very gently so that you get a slow, controlled release of the gas into the balloon (fig. 2). When the balloon is filled approximately to its optimal size (fig. 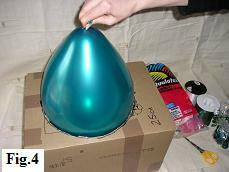 3) you check it using your balloon sizer (fig. 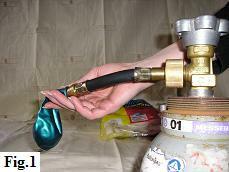 4) and inflate or deflate as appropriate. When the balloon is the correct size then you tie a knot. 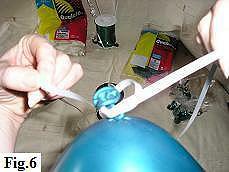 Check out our "Tips & Tricks" for an easy and quick way to tie a balloon knot. Cut about 2.5 m of ribbon. Take one end and tie a loose knot (fig. 5). Leave half a meter spare at the balloon end. Slip the knot over theneck of the balloon and tie it in front of the knot (fig. 6). 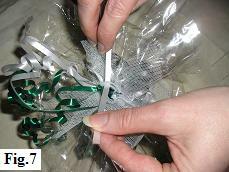 Tie a second knot to attach the ribbon securely. 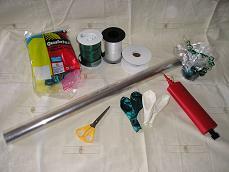 Now attach the other end to your balloon base allowing 1.5 m of ribbon from the base to the balloon. The first balloon will be the highest of the three in your centerpiece. 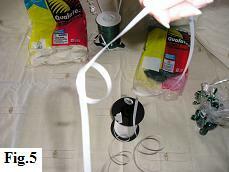 Once you're happy with the height, tie off the ribbon with two securing knots (fig. 7). Click here for Steps 3 and 4 of your Bouquet "Simple & Elegant".